The contents of our Sites are protected by copyright and trademark laws, and are the property of their owners. 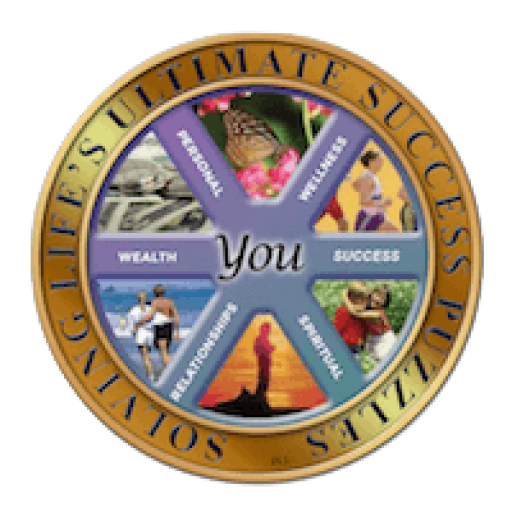 “Solving Lifes Success Puzzles” is trademarked by Charles Betterton, and all information on the Sites is copyrighted by Solving Lifes Success Puzzles. Unless otherwise noted, you may access and use the information and materials within the Sites for your personal use. You may not change, modify, delete, display, transmit, adapt, exploit, or copy for distribution or sale any information, material, trademark, or copyright on the Sites. You must obtain written permission from us or any other entity who owns intellectual property on the Sites before you may publish, distribute, display, or commercially exploit any material from the Sites. By using the Sites, you agree to abide by all copyright notices or other posted restrictions. A “forum” means any message board, chat room, user review forum or other interactive service appearing on any of the Sites and includes both public boards and private folders. You must register in accordance with instructions that you will find on the Sites in order to contribute to any forum. You may not post on any forum, or send to any other forum user or our staff, any material that is abusive, vulgar, threatening, harassing, libelous, defamatory, obscene, invades a person’s privacy, violates any intellectual or other property rights, or that would otherwise violate any law. You may not use any forum in a commercial manner. You may not post material that solicits funds, or that advertises or solicits goods or services. You may not post material known to be false. You may not post messages that contain stock touts. You may not post or transmit any information, software or other material that contains a virus or other harmful component. We are not responsible for material appearing in any forum on the Sites, except for material signed by one of our identified representatives. We are not responsible for screening material posted by users for libel, obscenity, invasion of privacy, copyright or trademark infringement, accuracy, or for any other reason. We retain, however, the right to modify or remove messages or other material that we, in our sole discretion, consider infringing, offensive, abusive, defamatory, obscene, stale, or otherwise unacceptable. We also reserve the right to edit materials for any other reason. Whether or not we modify or remove such material, users remain solely responsible for the content of their messages or postings. By posting on the Sites, you grant (or warrant that the owner of such rights has expressly granted) us and/or relevant affiliated companies the worldwide, perpetual, non exclusive right to use your questions, comments, and postings, in their original or edited form, in television programs, books, articles, commentaries, or in any other medium now known or later developed. You also warrant that you own or otherwise control all of the rights to the content you have posted and that the public posting and use of such content by us will not infringe the rights of any third party. Additionally, you warrant that any “moral rights” in posted materials have been waived. You are not entitled to any compensation for any materials you may post on the Sites. We don’t believe in “get rich” programs – only in hard work, adding value, building a real and professional career, and serving others with excellence and constancy. Our programs are intended to help you share your message with a wider audience and to make a difference in the world while growing your personal brand. Our programs take a lot of work and discipline just like any worthwhile endeavor or professional continuing education program. Please don’t enroll in our programs if you believe in the “money for nothing get rich quick” myth or ideology; we only want serious people dedicated to real professional development who want to add value and move humanity forward. As stipulated by law, we can not and do not make any guarantees about your ability to get results or earn any money with our ideas, information, tools or strategies. We don’t know you and, besides, your results in life are up to you. Agreed? We just want to help by giving great content, direction, and strategies. What we can guarantee is your satisfaction; we give you a 14-day 100% satisfaction guarantee, so if you are not happy for any reason with the quality of our training, just ask for your money back. You should know that all products and services by our company are for educational and informational purposes only. Nothing on this page, any of our websites, or any of our content or curriculum is a promise or guarantee of results or future earnings, and we do not offer any legal, medical, tax or other professional advice. Any financial numbers referenced here, or on any of our sites, are illustrative of concepts only and should not be considered average earnings, exact earnings, or promises for actual or future performance.Making decisions based on any information presented in our products, events, services, or web site, should be done only with the knowledge that you could experience risk or losses just like any entrepreneurial endeavor. Use caution and always consult your accountant, lawyer or professional advisor before acting on this or any information related to a lifestyle change or your business or finances. You alone are responsible and accountable for your decisions, actions and results in life, and by your registration here you agree not to attempt to hold us liable for your decisions, actions or results, at any time, under any circumstance. The Terms of Service are subject to change at any time and at the sole discretion of the Site owner and operator. Please visit the site regularly for updates.